Every brand marketing agency enjoys the excitement of keeping up with marketing trends. Here is packed-full article on key marketing trends. Our annual overview at the latest trends in digital media and technology takes a close up look at how they will impact marketing trends. The year ahead promises to be an action-packed year for the online marketing. Content marketing is sapping up as one of the most important areas of eCommerce promotion. It will continue to grow in 2016. So it is worth watching for trends Marketers should know. Remember the Alex from Target phenomenon last fall? A 16-year-old cashier was bagging some items at Target when a young woman inconspicuously snapped a photo of him and posted it on Twitter. Before the end of his shift, Alex Lee was an internet celebrity and didn’t even know it. That’s the power of Gen Z—the demographic of people born after 1995, and the first generation unfamiliar with life before the ubiquity of laptops, smartphones and tablets. Millennials have been credited with changing the face of marketing due to their penchant for personalization and their reliance on digital devices for shopping, but what about Gen Z? If the teens of today are capable of bringing an unknown person to outright fame within mere hours, just imagine what they can do to and for brands. Though teens aren’t yet fully independent—still largely reliant on their parents for financial support—they’re already highly influential shoppers. According to Piper Jaffray’s spring 2014 “Taking Stock with Teens” survey, teens are most influenced by their friends and the internet, two elements that merge on social media. It goes without saying that marketers who get it right with this demographic will surge ahead in their category. But where to start? A crucial step is understanding where and how the 13 to 18 years olds of today like to communicate. Here’s what marketers need to know about teens’ tech habits. A study released in April by the Pew Research Center found that 73% of 13 to 17 year olds in the U.S. have access to smartphones, while 15% only have basic phones. Non-Hispanic black teens, according to the study, are the likeliest to use smartphones, as 85% of those surveyed report they own one. This opens the doors for marketers to create tons of mobile-specific content to reach these consumers. As we’ve noted in the past, Tumblr, whose user base skews younger, is a fantastic mobile touchpoint for brands to engage with fans and potential customers. Teens are much more partial to one particular type of smartphone, according to research. Piper Jaffray found in the fall of 2014 that 67% of teens (with an average age of 16) have iPhones, meaning that brands need to be mindful of how their content—photos, emojis, GIFs and others—will execute on these devices. Marketers should note, however, that smartphone use is less prevalent among teens residing in rural areas and in households with an annual income of less than $50,000. For brands looking to reach these teens, they’re better off sticking with desktop-friendly methods of communication. Some 87% of teens surveyed by Pew reported they have access to a desktop, laptop or tablet computer, with teens in rural areas over-indexing in computer ownership. Reports from the media that teens have officially abandoned Facebook (or not) have been circulating for nearly two years. So what’s the deal? Are they on Facebook, or have they moved on? 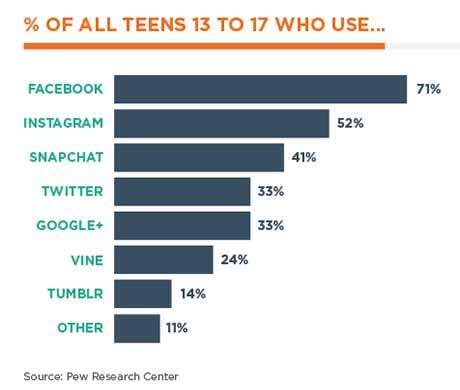 Well, according to the Pew survey, 71% of 13 to 17 year olds report that they do use Facebook – more than they do any other social network. But just because they have profiles on the social network doesn’t mean they’re particularly active users. In its spring 2015 survey, Piper Jaffray found that Instagram is the most important social network among teens, with nearly one-third of those who were surveyed choosing it over all others. It makes sense. Instagram is the most mobile-friendly of all the social platforms, and it facilitates a major component of the teen experience – the feeling of wanting to show your peers who you are, all while trying to impress them. A 2015 Facebook IQ study shows that 63% of 13 to 24 year olds use Instagram to help document their lives, and 53% credit the platform with helping them define who they are. In general, social network adoption tends to skew female, and that’s particularly the case with teens and visual platforms. Young women are far more inclined than their male counterparts to use Instagram, Snapchat, Pinterest and Tumblr. Some 61% of Instagram users are girls, compared with 44% of boys. Though it may seem Tumblr adoption among teens is low compared with the other networks, marketers shouldn’t discount it as a valuable marketing tool. Tumblr adoption is a completely different tale when we split the genders, as 27% of girls between the ages of 15 to 17 are active on the platform. The takeaway here? Instagram seems to be the holy grail for reaching today’s teen girls. Not only is it a place for them to show off who they are and what they have, but it’s also a place for them to learn and absorb from their peers, helping them further establish their own identities. Marketers can tap into this by integrating this type of deeply personal content in the form of user-generated content onto their feeds. Brands such as Free People and Alex and Ani have mastered the art of UGC on Instagram and receive a lot of positive engagement when they share fan photos. As Pinterest recently announced, its platform really isn’t about social sharing; it’s meant for discovery and planning for the future. We know that men haven’t been as reliant on pinboards as much as their female counterparts, so it’s no surprise that teen boys aren’t strong users of these platforms just yet. 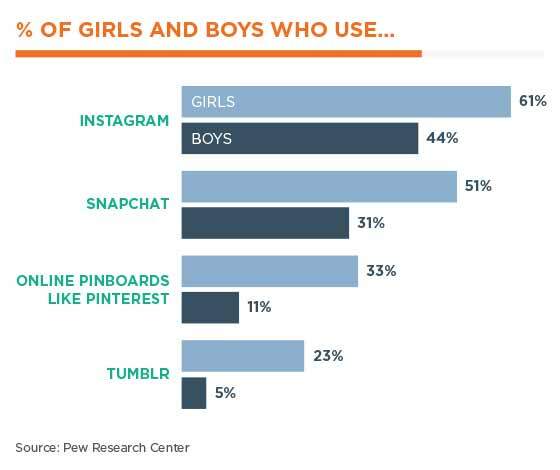 Just 11% of boys use online pinboards compared with one-third of teen girls, according to Pew. Older girls and teens who reside in households with incomes of $75,000 or more are the most inclined to use online pinboards. Brands that are looking to make their content discoverable to these demographics should incorporate Pinterest into their marketing strategies. Older teen girls are turning to pinboards at a critical stage of their lives – just as they are figuring out what to do as they enter adulthood. This means there are tons of content marketers can create to help them navigate the next step of their lives. To that end, your pins should aim to inform, to inspire and to otherwise provide value. According to Piper Jaffray’s spring 2015 study, Amazon is by far the top preferred shopping site for teens. It all becomes clear when we consider teen spending habits. A 2014 survey from Forest City Enterprises and research firm Alexander Babbage found that 13 to 17 year olds are less brand-oriented and more price-oriented than 18 to 24 year olds. How to Get Cheap ​Shipping on Heavy Items is crucial matter. Amazon caters well to finding lower-cost alternatives to what these consumers might want to purchase. They still love brands such as Nike, Forever 21 and Victoria’s Secret, but because price is such a big factor for them, they’re more likely to turn to Amazon for something in their price range. Emojis are everywhere. It’s nearly impossible to scroll through an Instagram feed without seeing a bunch of them being left as comments. It’s so prevalent in fact, that Instagram recently released the ability to add hashtag emojis on the platform. Conversely, on Tumblr, GIFs are everything. Last week, Slate published a debate about GIFs being superior to words as a method of communication. This is how the teens of today communicate: in images. Spotting another Instagram user post a laughing-so-hard-until-my-eyes-water emoji in the comments section of a photo instantly signifies “This will make you laugh.” GIFs and emojis are quick ways of expressing one’s feelings, and often do a better job at it than words can. 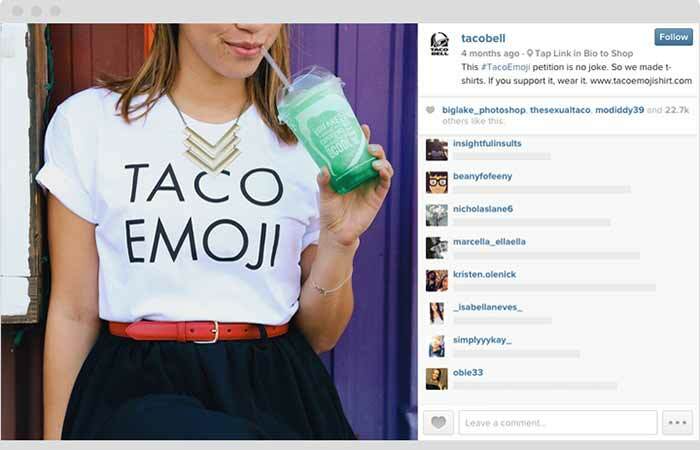 Brands who skillfully master emoji and GIF communication will take their connections with fans to the next level. Denny’s is the prime example of a brand that does this well on Tumblr. The text posts on their blog are far and few between, while GIFs bring life to the page. It’s a hit with the teen demographic, and has really catapulted the brand into a favorite on Tumblr, with some posts garnering more than 18,000 notes within several days. Today’s teens are unlike those from any other generation. The always-on aspect of their lives makes them unique consumers and communicators who are constantly evolving, signifying that marketers need to evolve along with them. These insights barely scratch the surface of what brands need to know to fully engage these teens. 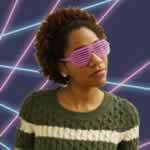 Stephanie is a Content Strategist at Curalate. She enjoys analyzing data and writing about consumer trends.